On "the growing good of the world"
I met a couple recently who have helped to look after my mother's house for some time. I hadn't known a thing about them, and that in itself is a long story. They were there when they were needed; I wasn't needed and they have kindly not asked me why. 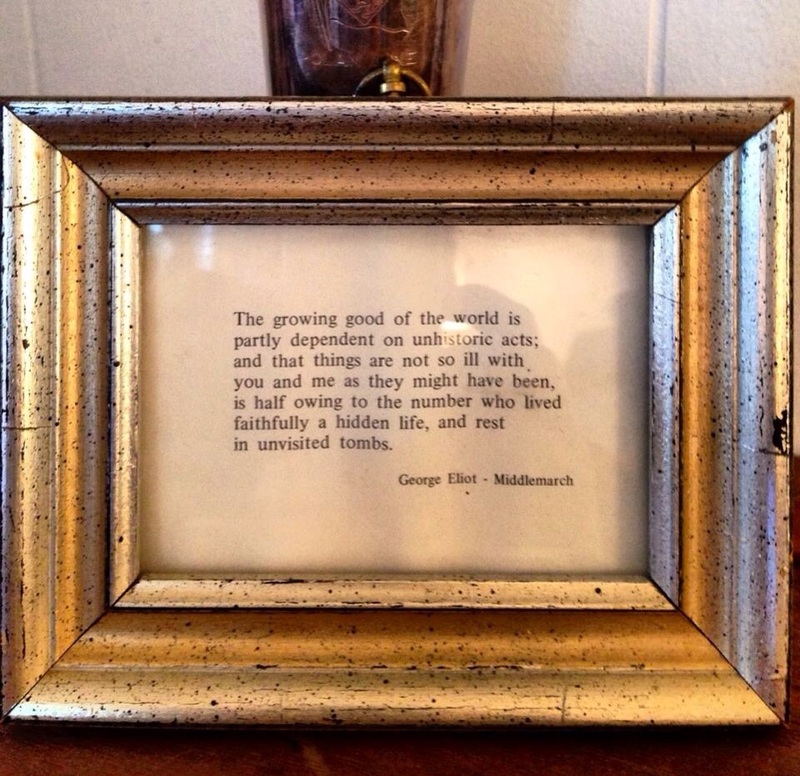 My parents became bitter toward each other, so it feels a little jarring to mention my father in this context, but the couple who helped my late mother have reminded me of the closing lines of Middlemarch, which he framed, and which hung above his desk for three decades. He was a great reader of Victorian novels -- this one, in my favourite description, a "cathedral of words" -- and I believe that he found through George Eliot the perfect reflection of the remarkable people whom he met as he worked to establish the Ontario Medal for Good Citizenship in the early 1970s. "[T]he growing good of the world is partly dependent on unhistoric acts; and that things are not so ill with you and me as they might have been, is half owing to the number who lived faithfully a hidden life, and rest in unvisited tombs," reads the passage that he framed. A critic once described those lines as "quietly thrilling"; Rebecca Mead, the author of My Life in Middlemarch, notes the "vein of melancholy" that runs through it. While researching her acutely observed story of lifelong engagement with the novel, Mead found that Eliot tinkered with that final sentence for awhile to get it right -- a heartening thing for any writer to learn. "It was a moment of shock," Mead told me when we talked about her book after it was published last year, "to realize that it was not as I knew it." This was a moment of profound connection with her literary idol: "You can picture it: as we all are, so relieved and exhausted to come to the end of something. You put down something that is not perfect and then you go back and polish it, in Eliot's case, to absolute perfection." The words that move us, the ones we carry with us, shift around quietly in the background of our lives, and sometime it's hard to know why. I find the words of the hymn called The Pilgrim viscerally inspiring ("He who would valiant be/'Gainst all disaster...") though I am entirely without belief in what the pilgrim strives to follow. And sometimes the most apt words show themselves suddenly, clarifying everything. I couldn't be more grateful for them.